Victoria, BC, Canada – Reliable Controls is pleased to announce the release of the MACH-ProView LCD controller, a powerful and elegant BACnet® building controller (B-BC) and BACnet operator display (B-OD), which provides a plenitude of attractive, high-resolution, graphical interfaces for your controlled environment. Providing an attractive array of interfaces to engage occupants of smart and green buildings, the MACH-ProView LCD features a fully customizable LCD touch screen. This freely programmable controller resides on Ethernet, Power Over Ethernet (POE), Wi-Fi, or EIA-485 networks. 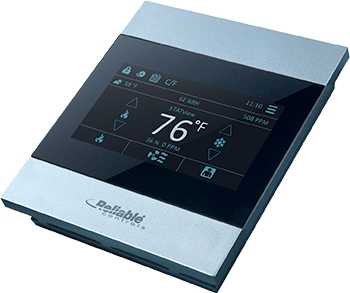 With the MACH-ProView LCD, users can access, configure, and control the comfort and energy performance of any space. Backed by an industry-recognized, 5-year warranty and a worldwide network of certified Authorized Dealers, the MACH-ProView LCD empowers you to easily monitor and control your building’s performance.